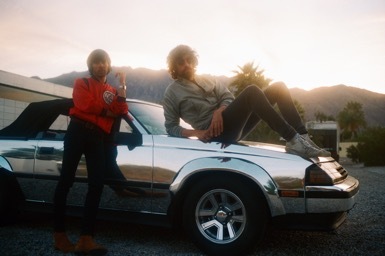 Justice recently unveiled their video for new single ‘Fire’, starring Susan Sarandon. ‘Fire’ is taken from the band’s third studio album ‘Woman’, which is out now via Because Music / Ed Banger Records. ‘Woman’ is the band’s first album in five years and contains ten brand new tracks including singles ‘Safe And Sound,’ ‘Randy’ and ‘Alakazam!’. Director of the video, Pascal Teixera, says: “On a hot summer afternoon, Gaspard and I are in Xavier’s kitchen, collectively daydreaming about washing a car. The year we like for car design, the make, where that could take place, how much soap, the mood, the sun, and there should be a woman to go cruising with, an iconic mix of cool, allure and strength - Susan Sarandon of course! Labelled by The Observer as “era-defining” in their 5-star review of the album, Justice’s debut LP ‘†’ was met with widespread acclaim and hit #1 on the U.S. Dance/Electronic Albums chart. Their 2011 follow up album ‘Audio, Video, Disco’ saw Justice expand upon their sound by further incorporating their numerous contrasting musical influences. Though known for their arena shows, this year they opted to perform spontaneous and unannounced DJ Sets at smaller, intimate venues in London, Paris, Berlin, Stockholm, New York, Brussels, Tokyo, tickets for which apparently sold out within minutes.